Barkhor street (sometimes spelled Bakhor Street) is the most famous walking street in Lhasa. It is in the heart of the Old Town – the oldest part of the capital. 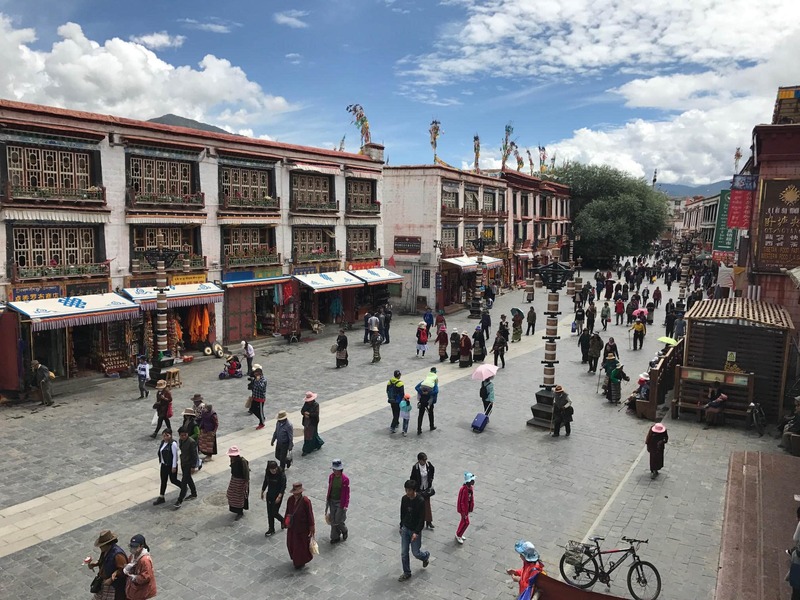 Barkhor street is the kora route around the 7th century Jokhang temple, therefore, you should walk there in a clockwise direction. The street is not very long, it only takes 20-30 minutes to walk it. However, you will inevitably make many stops on the way to take photos, watch pilgrims who travel here from all around the country, visit some souvenir shops and take a break in one of the tea houses or restaurants. Many of Tibetans complete this kora doing prostrations. There are some small monasteries on the street that you can visit while walking the kora. 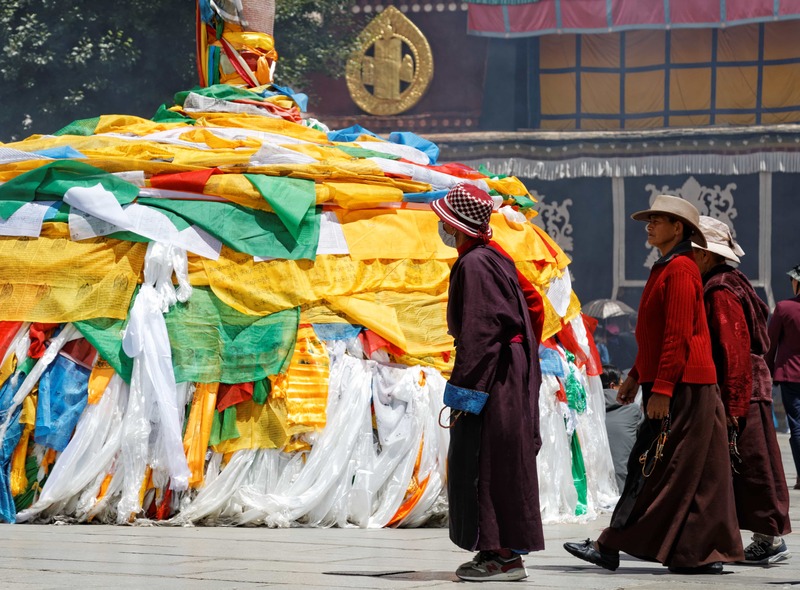 Start walking the kora from the front of the Jokhang temple. After you reach the large incense burner on the Northern side of it, you will see a small chapel with large prayer wheel inside and a row of small prayer wheels outside. It is Mani Lhakhang chapel. To the right from it is a small building that was used as a prison and now operates as a museum. Right behind Mani Lhakhang chapel you will see a yellow building. It is the Future Buddha temple with meditation cave. If you continue walking this road taking you to the South from the Barkhor Street, you will reach Meru monastery. From there, you can either come back the same way or take another side street going to the East. In either way you will be back on the Barkhor street. 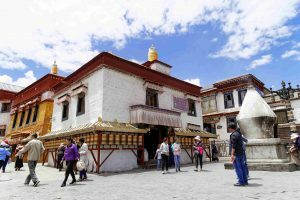 Continue walking the circuit around the Jokhang Temple. 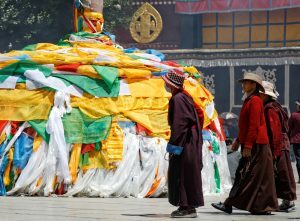 When you reach the colorful poles decorated with prayer flags, follow Tibetan pilgrims and walk to the left from them, leaving poles inside the circuit. When you want to take a break, visit one of the restaurants on the Barkhor Street. 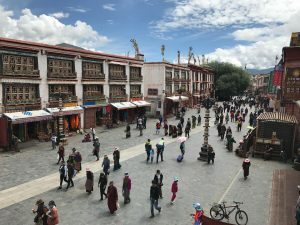 Some of them are located on the upper floors providing a great view on the street, roof of the Jokhang and sometimes, view on the Potala Palace as well. There are also a few side streets that you can take to see old buildings and Tibetans who live there.